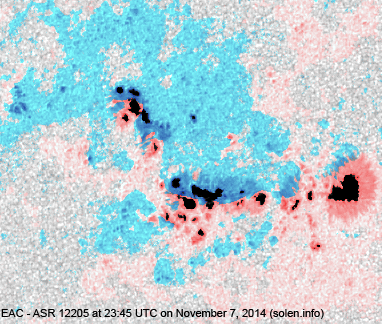 Last major update issued on November 8, 2014 at 05:40 UTC. 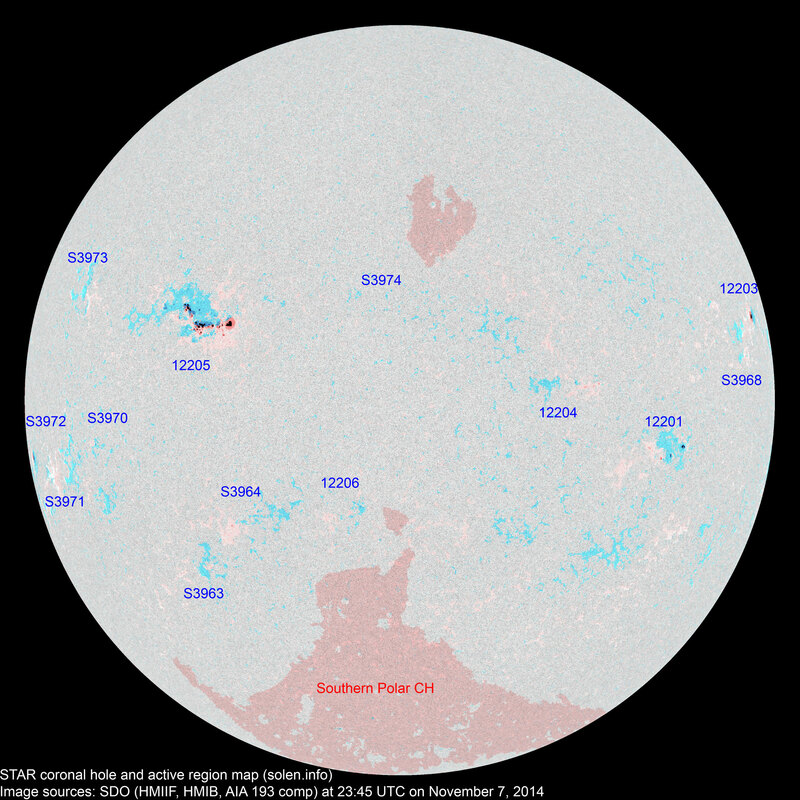 The geomagnetic field was quiet to unsettled on November 7. 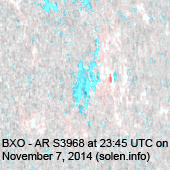 Solar wind speed at SOHO ranged between 442 and 532 km/s. 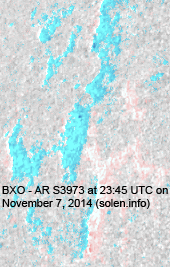 Solar flux at 22h UTC on 2.8 GHz was 132.0 (increasing 20.0 over the last solar rotation, the measurements at 18 and 20h UTC were flare enhanced). 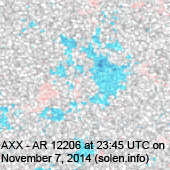 The 90 day 10.7 flux at 1 AU was 141.5. 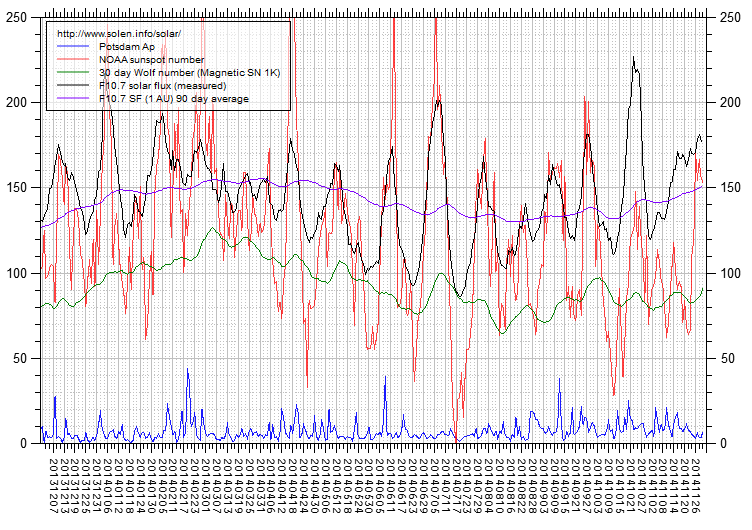 The Potsdam WDC planetary A index was 8 (STAR Ap - based on the mean of three hour interval ap indices: 8.4). 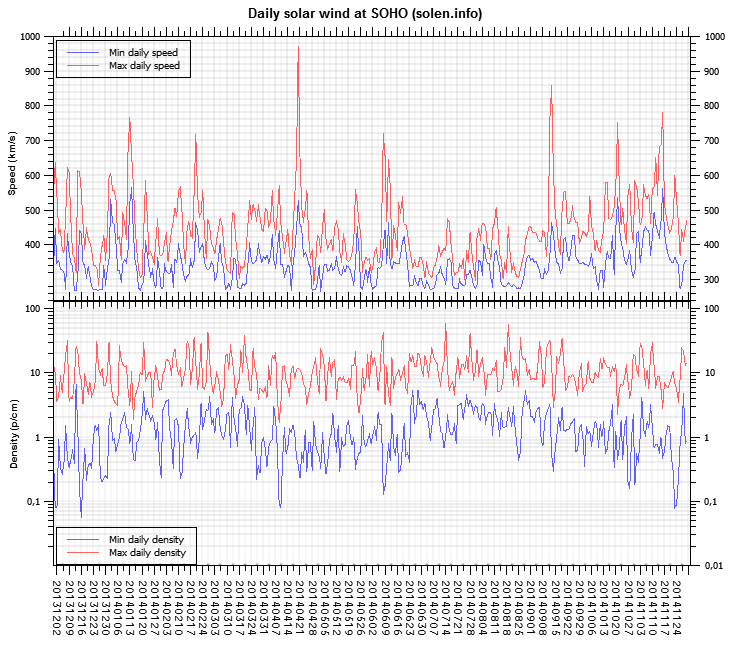 Three hour interval K indices: 22122223 (planetary), 22322423 (Boulder). At the time of counting spots (see image time), spots were observed in 13 active regions using 2K resolution (SN: 246) and 10 active regions using 1K resolution (SN: 156) SDO images on the visible solar disk. Region 12201 [S06W46] decayed slowly and quietly. 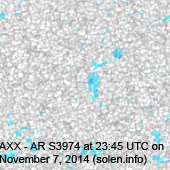 Region 12203 [N13W75] was quiet and stable. 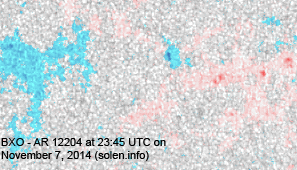 Region 12204 [N04W28] was quiet and stable. Region 12205 [N14E32] still has multiple magnetic deltas, two of them quite strong with poor separation of opposite polarity umbrae. 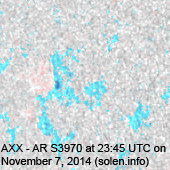 Another X class flare is possible. Region 12206 [S14E07] decayed slowly and quietly. S3963 [S24E33] decayed slowly and quietly. S3964 [S16E25] decayed slowly and quietly. New region S3968 [N07W68] emerged with penumbra spots. New region S3970 [S05E54] emerged with a penumbra spot. New region S3971 [S09E61] rotated into view with penumbra spots. 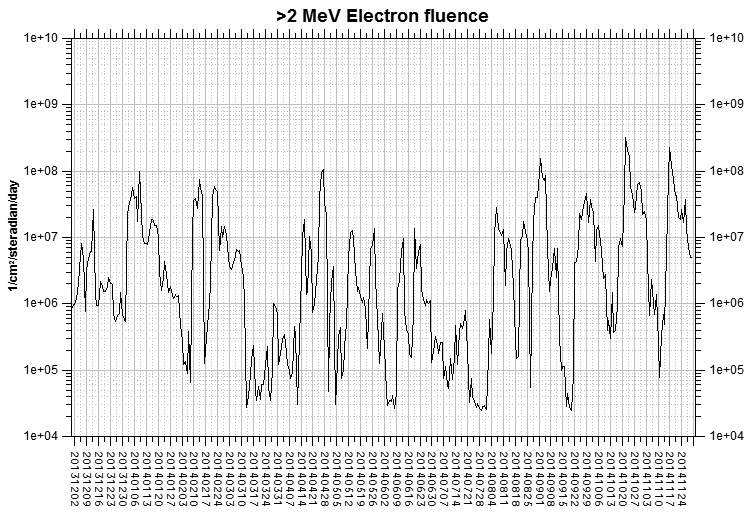 New region S3972 [S08E80] rotated into view. 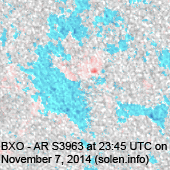 New region S3973 [N18E61] rotated into view. 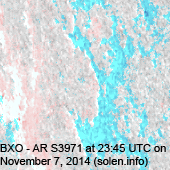 New region S3974 [N18E02] was observed with a penumbra spot. 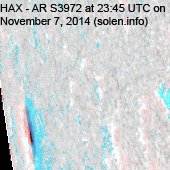 November 5: No obviously Earth directed CMEs were observed in LASCO imagery. 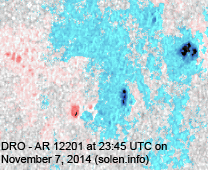 November 6: A partial halo CME was observed after the M5.4 LDE in AR 12205. 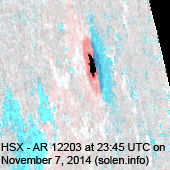 November 7: At least a partial halo CME was observed in association with the X1.6 LDE in AR 12205. 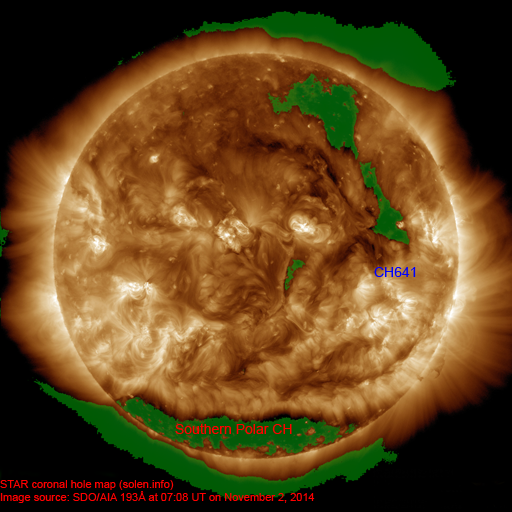 The geomagnetic field is expected to be mostly quiet on November 8. On November 9-10 there's a chance of unsettled to minor storm conditions should the CMEs observed on November 6-7 reach Earth.